Using a seatbelt doesn’t guarantee truck drivers or passengers will survive a crash with minimal injuries. But statistics show that buckling up helps increase the odds of walking away from a serious accident. About 14 percent of truck drivers don’t wear seatbelts and face a much greater chance of dying in a crash than drivers who wore belts, said Jack Van Steenburg, the chief safety officer of the Federal Motor Carrier Safety Administration (FMCSA). Speaking at last month’s annual Transportation Research Board meeting, Van Steenburg revealed statistics showing that the risk of death in large-truck accidents is greater when occupants are not wearing seat belts. In 2017, there were 713 large-truck occupants involved in fatal crashes who were not wearing seatbelts. Of those, 45 percent died in the crash compared to just 8.8 percent who died despite being belted. Both percentages were up from 2016. FMCSA regulation 49 CFR §392.16 requires truck drivers and their passengers to wear a seatbelt when one is available. Drivers who violate the rule are subject to penalties as high as $3,760. Motor carriers also could face fines as high as $15,000. States also carry penalties for seatbelt violations. 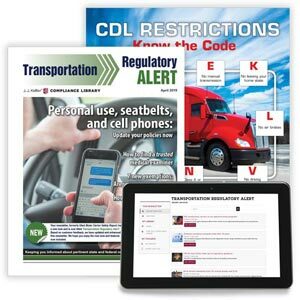 J. J. Keller's Motor Carrier Safety Report keeps you current on federal and state compliance information that impacts your drivers, trucks, and bottom line.